Have You Tried DD-WRT Firmware? DD-WRT is a type of aftermarket firmware for wireless broadband routers. Available online from dd-wrt.com as free, open source downloads, DD-WRT contains special features and optimizations designed to improve on the standard firmware that router manufacturers provide with their products. Originally created for certain models of Linksys routers, DD-WRT has been developed over many years to be compatible with other popular brands and models. 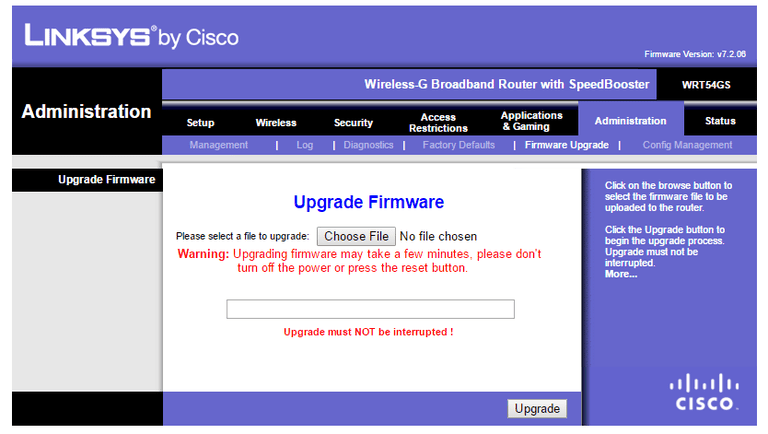 Users install DD-WRT on routers using the firmware upgrade (also called firmware flashing) process. Routers contain a small fixed amount of persistent flash memory - usually 4 megabytes (MB), 8 MB or 16 MB in size - where the firmware is stored. Like other kinds of router firmware, DD-WRT firmware exists in the form of a binary file. Originally designed for use with certain models of Linksys routers, DD-WRT has expanded over the years to be compatible with other popular brands. To give the router owner more control over what kind of firmware they must install, DD-WRT supports multiple firmware images for each router. The largest versions contain the most feature support but are more likely to need extra configuration, while the smaller versions strip out features some people may not want that in turn can help increase performance and/or improve stability. The Mini and Micro versions range in size between 2 megabytes (MB) and 3 MB. The nokaid version is the same as the standard version minus support for the XLink Kai gaming service. As the name suggests, the VoIP and VPN versions include additional support for voice over IP and/or VPN connections, respectively. Finally, the Mega versions approach and sometimes exceed 8 MB. DD-WRT does not support all seven packages for every router model; in particular, Mega packages cannot fit onto older routers that only contain 4 MB of flash memory space. DD-WRT is one of three popular custom firmware options. Each of the three has its own loyal following and also different design goals. Compared to DD-WRT, OpenWRT offers even more customization options. Furthermore, OpenWRT is designed to be modified and extended by firmware coders. The average home router owner will find these extra bells and whistles much too complicated, but advanced users and hobbyist coders greatly appreciate the firmware creation environment that OpenWRT offers. Tomato firmware attempts to offer an easier-to-use customization interface than DD-WRT. Those who have difficulty getting DD-WRT to work reliably on their router sometimes have better luck with Tomato. This package tends not to support as many different router models as DD-WRT, however.